Yoga: The Art of Transformation, the world’s first exhibition on the art of yoga, will open at the Freer|Sackler in October. Bento had a chance to speak to exhibition curator Debra Diamond about an 1894 meeting between museum founder Charles Lang Freer and Swami Vivekananda, a key figure in bringing Indian philosophies about yoga to the West. Bento: Did Charles Lang Freer know about yoga? Debra Diamond: Probably. 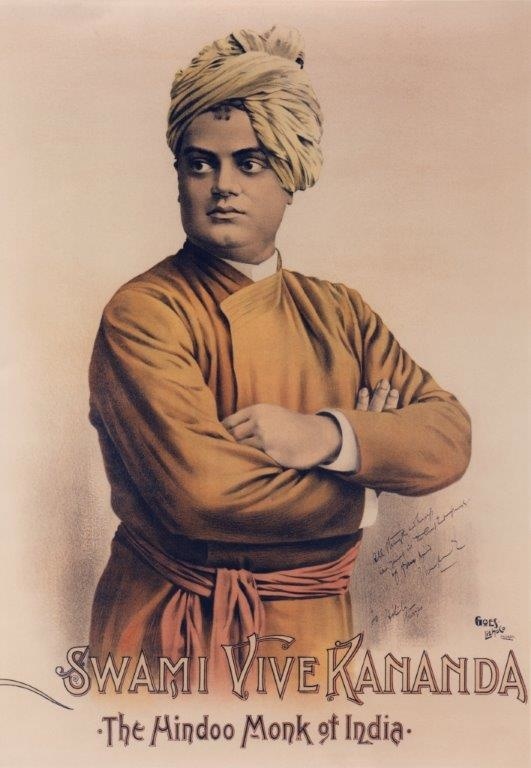 Swami Vivekananda (1863–1902), the first truly influential teacher of yoga to come to the United States, arrived in Detroit in 1894 to give talks at local churches and a synagogue. Freer hosted a dinner for him at his home on Ferry Street. Bento: Why was Swami Vivekananda in the United States? DD: He came to participate in the World’s Parliament of Religions that was part of the Chicago World’s Fair—the World’s Columbian Exposition of 1893. Well spoken, charismatic, and exotic in his orange robes, Swami Vivekananda was a huge hit. He introduced a rational and ecumenical Hinduism that was very appealing to Westerners interested in Eastern spiritual and religious traditions. His talks were so popular that the organizers scheduled them for the end of the day, so the auditorium wouldn’t empty out in the afternoons. Although Emerson knew of Indian philosophy and Thoreau had said, “At times, even I am a yogi,” it was really Swami Vivekananda who made yoga well known in the United States. Bento: Why do you think Freer was intrigued? DD: Freer had a cosmopolitan worldview, and he was part of a social and intellectual sphere that was interested in spirituality and Asian cultures. Senator Thomas W. Palmer, who would become the first president of the Detroit Museum of the Arts [now the Detroit Institute of the Arts], lived down the street from Freer. Palmer served as president of the Fair and had Swami Vivekananda stay with him in his home. Bento: What did Freer think of Swami Vivekananda? Bento: Could Swami Vivekananda have inspired Freer’s trip to India the following year? DD: Maybe he was inspired. Maybe he got travel tips! But we really don’t know if there is a connection. Freer’s diaries are pretty sparse at this time. Bento: Are there principles in Swami Vivekananda’s teachings that we would recognize today? DD: Swami Vivekananda’s Raja Yoga is a foundational work in the dissemination of yoga across the world. In the book, Vivekananda writes that “Raga Yoga…never asks the question of what our religion is. We are human beings, that is sufficient” (Raja Yoga, 1896). His commentary on (and translation of) the aṣṭāṅga (eight-limb) yoga section of Patañjali’s Yogasūtras focuses on its potential for spiritual growth. All of these things color modern discourses about yoga. Swami Vivekananda was probably the first to really convey the message that yoga was something that Americans could do. We recognize that today, and it’s taken for granted, but it was not previously. For more on Swami Vivekananda’s role in yoga history—including why he wasn’t interested in the postures of hatha yoga that we know so well today—come see the exhibition in October! Want to contribute to the Yoga exhibition? Donate to our “Together We’re One” crowdfunding campaign or email us at yoga@si.edu to see how you can get involved.